The EcoPass, an RTD program that allows schools, businesses and neighborhoods to buy unlimited transit rides for their members, appears no longer under threat. 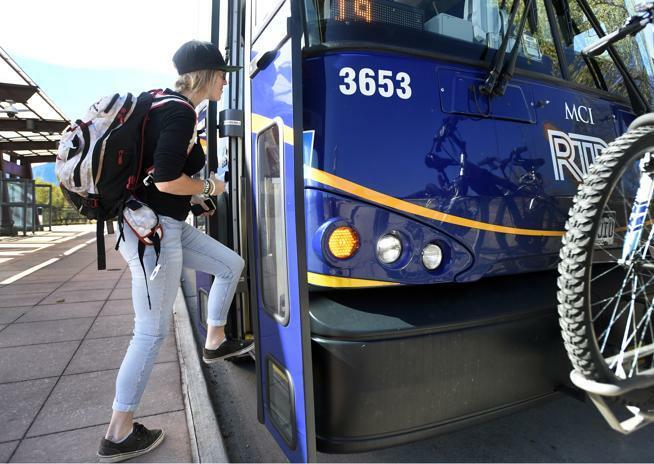 That’s because the working group RTD tasked with examining the district’s pass programs recently got to examine the projected impact on revenue and ridership under scenarios that cut into or eliminate the EcoPass, and the group didn’t like what it saw. RTD’s target fare revenue in 2019 is about $170 million, and it’s not clear there’s a way for that target to be met, but under the scenario currently most appealing to the working group — one in which the EcoPass remains — the shortfall would be only be about $17 million. RTD is especially wary of any potential cuts to its current service, because the district is having a tough time as it is keeping up with existing demand, much less considering many new routes or initiatives. Saddled with nearly $4 billion in debt, RTD is also facing a huge driver and mechanic shortage, and is suffering more missed and delayed trips. The pass program working group includes officials from around the 40-community RTD service area, and, all along, the group’s Boulder County cohort had been pushing for a product that did not involve slashing the EcoPass. While the county accounts for about a tenth of total RTD service, it has a disproportionately high stake in EcoPass, representing about half of all College Pass users and a quarter of business EcoPass users. John Tayer, CEO of the Boulder Chamber and a working group member, said he was pleased that his colleagues on the group are no longer seriously eyeing any options that cut the EcoPass. “I think it’s a positive step forward that the working group members, along with the consultants, recognized the benefits of the EcoPass programs,” Tayer said. The working group is going to present a report and recommendation to RTD’s board in a few months, so the EcoPass won’t officially be preserved until, and if, the board accepts the group’s advice. But even now that the group has whittled what were five main scenarios down to one, it must still answer some vexing remaining questions about the widely acknowledged inequity in the EcoPass program. The program works to the advantage of those who are members of institutions that can go in together on EcoPasses, such as the University of Colorado, businesses and well-organized neighborhoods. Often, low-income people who may stand to benefit most from a pass that, for under $2,000 a year promises unlimited rides across the region, are left out because they can’t claim the necessary memberships. According to Washington, those who qualify as low-income riders account for under 10 percent of all EcoPass users. It appears the group is leaning toward a recommendation that would not make the EcoPass programs more equitable, but rather create a new program for riders somewhere in the range of 150 to 200 percent of the federal poverty line; as of now, 185 percent is one likely level at which it’d be set, though that has not been finalized. This new program would offer a 50 percent discount on all fares, Washington said. Were it set to apply to those at or below 185 percent of the federal poverty line, for example, that would mean individuals making under about $25,600, or families of four making under about $52,336, would qualify. RTD estimates that 39 percent of its rider fall at or below the 185-percent mark.